Wash and Fillet the Whole Salmon. Remove all the bones using a tweezer. Mix all the ingredients and rub the fish with mixture. Place fillet skin side down on a large dish and the second fillet back to back and cover with Aluminium Foil. Then weigh it down with heavy chopping board and refrigerate for 12 hours. Then turn the fish and re-weight for another 12 hours. Remove from the pan and drain off the liquid. Wash the fish with cold running water quickly and wipe off with a paper towel. Finely chop dill and mix with 1 tablespoon Earl Grey Tea. Rub the fish with Olive oil then rub the dill and Tea Mixture. 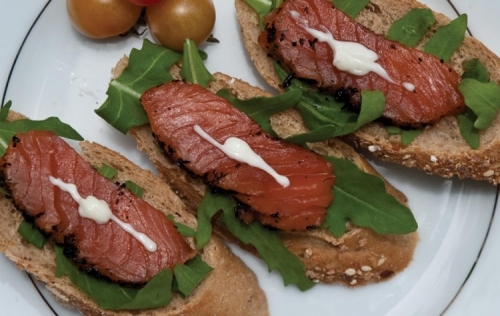 With long knife slice the Salmon diagonally into very thin slices.Cut the Bread loaves diagonally and dress with rocket lettuce and cherry tomato. Then arrange Cured Salmon on top and drizzle dressing over it. Serve Immediately.